The Rev'd W E Buckland wrote in the Parish Magazine of 1895, that in 1875 the present organ, built by Messrs. Brinley and Foster, was purchased and put in the north side of the Chancel, chiefly by the exertions of the Honourable Mrs Mansfield Parkyns. The cost was defrayed by a collection in Church at the opening, £25 14s. 4d. and by subscriptions of which the chief were Mr Mansfield Parkyns £20 and Rev'd. S. L. Oldacres £10. To commemorate the Coronation in 1953 The Church Council decided to open a fund for the installation of an electric blower for the organ to mark the coronation of Queen Elizabeth II. The approximate cost would be £75. An article published by the Thoroton Society refers to the organ originally built by Brinley and Foster and installed in 1875 in the north side of the chancel, played from the organ loft in the tower. The current organ is an electronic instrument, purchased from Makin Organs Limited of and installed in January 1985. 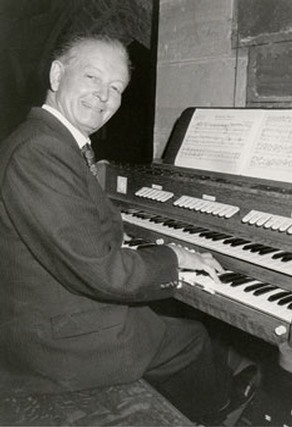 May 1969, "the work on the new organ is proceeding as fast as possible and we hope that it will not be very long now before we are able to use it. In the meantime I would like to say how very grateful we were to Mr Sam Knowles for the loan of his electric organ which was a great help especially over Easter and for two weddings". In 1977 the replacement of the church heating, at a cost of £3,150, is proceeding smoothly and the new heating should be working in time for Sunday December 11th 1977 all being well. A failure in the old system caused an overflow which has damaged the organ severely. Work cannot begin on the repair until after Christmas, and it is hoped to use it in time for Easter although the damage is so extensive this cannot be guaranteed. The estimated cost of repair is around £4,350, most of which will be covered by insurance. In January 1985 M J Stokes wrote this special supplement for the Church Magazine. 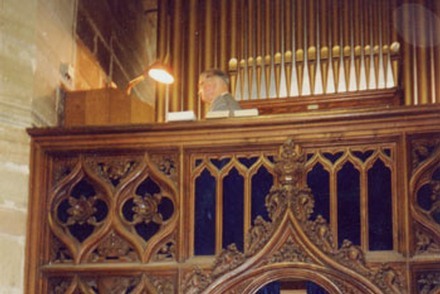 So that all the people of Woodborough would have a closer insight into the case for replacing their Church pipe organ with a pipeless instrument, to emphasize what that means for the people of Woodborough, and to stimulate participation in taking advantage of the “double your money” offer, so generously made by the Eastwood Foundation. “I've done my best, but how long will it last is anybody’s guess”. That comment is noted in the organ maintenance record, and it was made last Easter by Messrs Cousans, the Organ Builders responsible for our organ. “Deteriorations have set in with a vengeance”, they have said. In a letter written in February 1984, and in the ensuing year matters have indeed got much worse. The organ has been quite un-playable on a number of occasions in the last months, and so events have proved that the PCC were right in giving consideration to the problem. 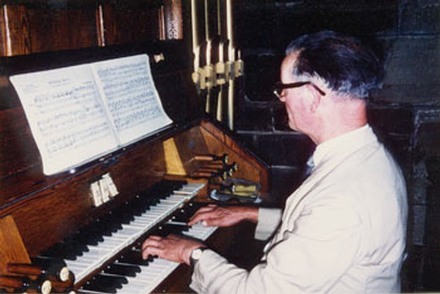 This is a special occasion, and this photograph of Mannie playing the new church organ in 1985. Special, not just because it was a new organ, but at this service it was dedicated to his name. Mannie also announced his retirement as organist at St Swithun's, but it is thought that this did not last long. He was still playing both this organ and the organs of other neighbouring parish until at least the early 21st century. “Can we justify any kind of expenditure at all, in the face of the many other priorities our Church might have?”. That was a major question to which the PCC gave much thought. They concluded that they had a duty to maintain a musical content to aid and enhance worship, and that they should shoulder that responsibility now, and not leave it to be picked up by a future generation, when other priorities might make such provision more difficult, or even impossible. For those who are less regular worshippers, the PCC had in mind those great Festivals of Christmas, Easter, Confirmation, which attract so many to our ancient Church, those National days of Remembrance and Thanksgiving, and those occasions so important to participants, the weddings, the funerals, the blessings, in which music, and particularly the organ, plays such an important part. was put at £500. (since reduced to £250). The Parochial Church Council (PCC) immediately rejected such expenditure as being unjustifiable in priority terms, and unrealistic in financial terms. The alternative was to explore the possibility of a pipeless organ, and if possible to incorporate such an instrument within our present organ, retaining the front and decorative pipes in their present position. This has been possible, and the new organ will be replaced in the Nave temporarily, which will only be for the time required to dispose of the working (or rather non-working) parts of the old instrument. New methods of generation of sound have quite overtaken the synthetic tone of earlier electronic instruments, and the exciting and authentic tones which are now produced can be heard in such centres of musical excellence as Liverpool Cathedral, Ripon Cathedral, Lancaster Abbey, Preston and Southport Parish Churches, and Nottingham Royal Centre Concert Hall, to name but a few. Naturally, the St Swithun’s organ will be on a much smaller scale, but tonal reproduction will be exactly the same as with these larger classical organs, and with a 20 year guarantee, and virtually no maintenance costs, such an organ emerged as the obvious solution to both priority and musical considerations, if financially possible. In the event, that possibility has become a reality through an approach made by David Garratt to Sir John Eastwood, who immediately offered to donate half the £8,000 required for the purchase, conditional on the people of Woodborough raising the other half by March 1985. It is incumbent on all who value St Swithun’s, those who worship there regularly, those who do so less frequently, and those to whom its doors are always open when they need it, to take advantage of this unique opportunity to “double our money”, and ensure we have an organ for the future. At present, the Organ Fund stands at about £2,000 (worth £4,000). Another £2,000 (to be doubled by the Eastwood Foundation), is needed, and a Concert, Raffle, sponsored Hymn Singing are already behind us or in hand. It is the belief that the people of Woodborough will respond, and that the new organ has now been installed. Please send your donation to the Vicar, or hand it in at Church on Saturday February 2nd, between 2 p.m. and 4 p.m., when our organist will be pleased to demonstrate the organ to you. Please remember, 30 donations of £10 are worth £600, 50 donations of £5 are worth £500. Please do your bit! Organ Fund: At the time of my writing this article 9th March 1985) the amount in the Organ Fund is touching £3,000. The concerts in Church, presented by the Clarendon College Music Department, were a great success and raised £366. All of us enjoyed the signing of Miss Lynn Wayman, and I’m very grateful to Miss Anthea Cator, the Head of the Music Department, who has devoted a lot of time in preparing the concert in the Church. In addition individuals have responded very generously and have donated substantial amounts of money. We are very appreciative of your interest. The fund-raising committee is now working on a Grand Draw, with very good prizes, and tickets will be in circulation for this quite soon. In addition, the choir held a Sponsored Sing on 25th February. I must not forget also, the coffee morning which Mrs Margaret Middup kindly organized, which raised £64. I am glad to announce that at the suggestion of the PCC, Mannie Foster has agreed to have the organ dedicated as THE MANSFIELD FOSTER ORGAN in recognition of over 50 years service as organist to St Swithun’s Church. We plan to have the organ dedicated on Feast Sunday (7th July 1985). This will be done by the Archdeacon of Nottingham, Venerable Clive Handford, who will be our guest preacher at the 6 p.m. Feast Service. The target of £4000 was achieved by May 1985. With the new organ successfully completed, the Organ Fund remained in credit. As a result a conscious decision was made at the PCC meeting in November 1985 to transfer £200 to the Choir Fund, as this was thought to be closely related. This would enable the Choir to meet ongoing cost such as sheet music, affiliation fees to the RSCM and any choir robes that may be required in the future. Organ Recital: Mr David Wilson will be giving a recital on Sunday 17th March 1985 on the new church organ during the Evening Service. It will last about half an hour and will take place in the context of a shortened Evensong (in place of the sermon). The authors of this text have drawn much information from the book 'The History of Woodborough and of the Prebendal Church of Woodborough in the Peculiar of Southwell', by the late Rev’d Walter E. Buckland, published in Nottingham in 1897 by Sisson and Parker, booksellers of Nottingham. There are other contributions from Rev’d W E Buckland to this piece through his own articles in the Parish Magazines between 1894 and 1896. Buckland was also responsible for commencing a Parish Magazine in Woodborough. H. Gill gives a further account of the Church in the Thoroton Society Transactions, Vol.12, 1908. Regrettably the parish chest and most of the historic documentation has been lost or stolen.